With much of the attention regarding the struggle for Irish independence being on the upcoming centenary of the 1916 Rising, events in County Kildare 90 years ago this past December bring into sharp focus the tragedy of the subsequent Civil War. Paddy Nolan, 34, penned a heartbreaking final letter to his mother and father. He hoped that they would bear his death with “the Courage of an Irish Father & Mother.” He tried to ease his mother’s worry by writing that the chaplain in the Curragh, Father Donnelly, had told him that he would go straight to heaven. The men were buried in the grounds of the Detention Barracks, but their remains were later exhumed and lay in state in the courthouse in Kildare Town before being reinterred in Kildare’s Grey Abbey Cemetery, in 1924. A gravestone was subsequently erected over their collective grave and a monument erected in the Market Square, in Kildare town. 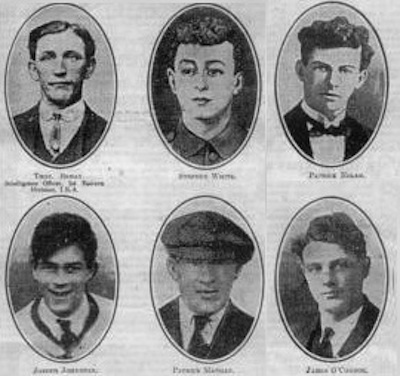 The seven executed were Stephen White, 18, Abbey Street, Kildare; Joseph Johnston, 18, Station Road, Kildare; Patrick Mangan, 22, Fair Green, Kildare; Patrick Nolan, 34, Rathbride, Kildare; Bryan Moore, 37, Rathbride, Kildare (leader of the column); James O’Connor, 24, Bansha, County Tipperary; and Patrick Bagnall, 19, Fair Green, Kildare.